Bonhams presents 19th Century European Paintings on May 4 at Bonhams New York. Consisting of more than 100 lots, the sale highlights the diversity in European art history — from the traditional views of Paris and modern British paintings of the Newlyn School, to an exquisite group of Orientalist paintings. Leading the auction is an exceptional work, Start for the Hunt at Gwalior, by Edwin Lord Weeks (1849-1903), known as one of the most distinguished American painters of Orientalist themes. This oil on canvas comes from the estate of distinguished collector Patricia Anawalt, Brentwood, Cali. (estimate U.S. $400,000-600,000). 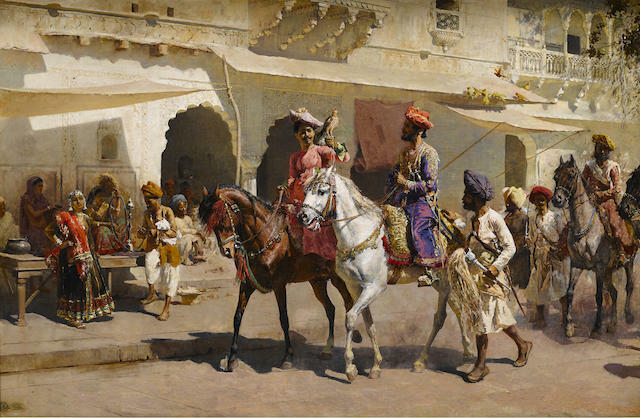 Famous for his use of light and color as well as his technique of exceptional realism, Start for the Hunt at Gwalior is a strong example of Weeks’ precision and quality. Both large and striking, it is among his greatest masterworks. The painting depicts the Maharaja of Gwalior, a small city in the north central state of Madhya Pradesh in India, setting off for a hunt with his falcon and courtiers, all dressed in dazzling garments. At that time, the Maharaja of Gwalior governed his princely state as part of a subsidiary alliance with the British rule. Weeks, on numerous occasions, painted the massive fortress and home of the royal family during his excursions to India. “This remarkable picture is one of Weeks’ finest works and a rare find at auction this season,” said Madalina Lazen, senior specialist of European paintings. Edwin Lord Weeks was a highly renowned American expatriate painter who worked in Paris during the last quarter of the 19th century. Born in Boston, Weeks undertook periodic expeditions through North Africa, Persia, and particularly India to procure the subject matter for his exotic paintings, returning intermittently to his Paris studio to execute formal compositions, usually larger than his in situ works done during his travels. Weeks exhibited regularly at the annual Paris Salons, and soon distinguished himself as a leading Orientalist painter of his generation, eventually achieving the highest distinctions within the academic art world of fin-de siècle Paris, including the Chevalier de la Legion d’Honneur. Also featured in the sale is The Favorite by Frederick Arthur Bridgman (1847-1928), another highly-acclaimed Orientalist painter. The work, dated 1882, is estimated at U.S. $250,000 – 300,000. Bridgman’s popularity was at its peak during the 1880’s when this painting was executed during a trip to Algiers. With access to a widow’s home – highly unusual because Westerners were not typically allowed into women’s quarters – he observed the daily life of the locals with an easel and brush in hand. The Favorite features the artist’s famous signatures such as the jewel-like rendering of the fabrics, the smooth and careful finish — all homage to his master, French painter Jean-Léon Gérôme. This significant work by Bridgman has a strong exhibition history, including a decade-long loan to the Los Angeles County Museum of Art (LACMA).